Large barrel chair, modern form, highly polished chrome plating over steel frame supports "floating" chair frame of wood, metal, and upholstery. When found, this barrel chair frame had no remaining marks or labels. It was acquired from a major auction house, where their 20th Century expert labeled it a "Harvey Probber original." We didn't then, nor do now accept that Probber attribution. But we may be wrong, and very much welcome any knowledgeable input. 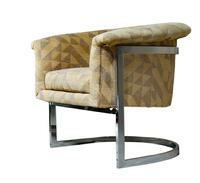 This chair has considerable characteristics suggesting a Milo & Thayer design. The feeling of the chair is incredibly substantial. It's heavy, but also very sturdy. The chrome work is mint, suggesting both considerable care in upkeep and considerable quality (thicker chrome plating) at the time of production. While we're able to document near identical chairs as Milo Baughman for Thayer Coggin, this chair remains unsigned and we offer only the attribution. 29"H x 33"W x 28"D; seat height 18"
Excellent Original Condition, very strong and sturdy. Upholstered in 2008.